The Washington Ballet brings back its annual holiday tradition of 'The Nutcracker' with all new surprises. Now, the Washington Ballet is combining both, putting local twists on the timeless story through Dec. 28 at the Warner Theatre. Here, the Nutcracker is a wooden doll of George Washington that comes alive to save Clara from the Rat King and his rat army of British Redcoats. “I’m a method actor, so I actually took out my teeth and replaced them with wooden stakes for my role,” dancer Marshall Whiteley cracked to WTOP. All joking aside, the local history certainly comes alive. Audiences can expect appearances by Thomas Jefferson, Frederick Douglas, Harriet Tubman, the Anacostia Indians and other local figures. “We’ll also be doing some fun celebrity walk-on roles, so make sure you keep your eye out for some local heroes and some figureheads from around the area to join us on stage,” says Scott Greenberg, public relations and publications manager for the Washington Ballet. Greenberg didn’t want to spoil the surprises, but he gave WTOP one little nugget. Unless you’ve been living under a rock — or a sugar plum — you know the story of Clara, who receives a Nutcracker from her uncle, sparking a fantastical coming-of-age journey on Christmas Eve. Those set designs are fun for the audience and the performers. Co-star Isabel Deyo interacts with multiple sets due to her variety of roles, playing a snowflake, a flower, a butterfly, a cardinal, a maid and the wife to Whiteley’s military husband. Her favorite set design is the box that houses the title doll. If the visuals don’t grab you, Tchaikovsky’s eternally recognizable music will. “It’s the music you hear on ads for Christmas that tell you, ‘Oh, it’s Christmas time,'” Deyo says. Even if you’ve seen the show dozens of times, this year is an extra-special convergence of anniversaries. 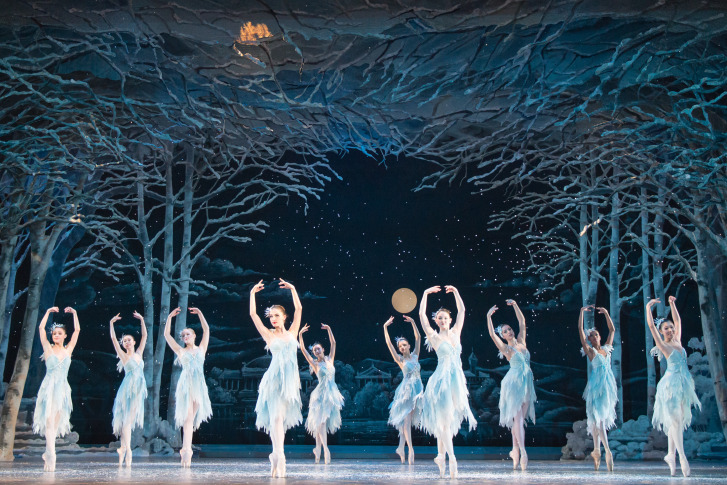 It’s the 70th anniversary for the Washington Ballet, the 10th anniversary of “The Nutcracker” at Warner Theatre and the 15th year of Septime Webre choreographing the show. Webre’s veteran chops make for demanding, yet rewarding, productions. Indeed, it’s a long way to the top if you wanna ballet. Whiteley grew up in Fairbanks, Alaska, did most of his training in San Diego, then came to the Washington Ballet on scholarship two and half years ago, before graduating into the studio company. Deyo grew up in San Luis Obispo, a small town on the Central Coast of California. She studied at the North Carolina School of the Arts for a year, before heading to New York City to dance at the American Ballet Theatre. This is her first year with the Washington Ballet. “I went to an open audition along with like 200 other people, heard back a couple of weeks later and decided to come,” Deyo says. Even once you’ve arrived at the Washington Ballet, it’s an intensive full-time gig. Whiteley and Deyo say they work from 9 a.m. to 6 p.m. Monday to Friday every week. The physical demands can also be gruesome. Whiteley says the dual nature of ballet — acting and dancing — makes for an even bigger challenge. Still, they say the hard work is worth it for the thrill of pleasing the audience. The ballet is holding a special Military Appreciation Day on Wednesday, Dec. 10, at 7 p.m. There’s also a Family Day, Girl Scouts Night and other novelty nights. For more information, visit the Washington Ballet website.